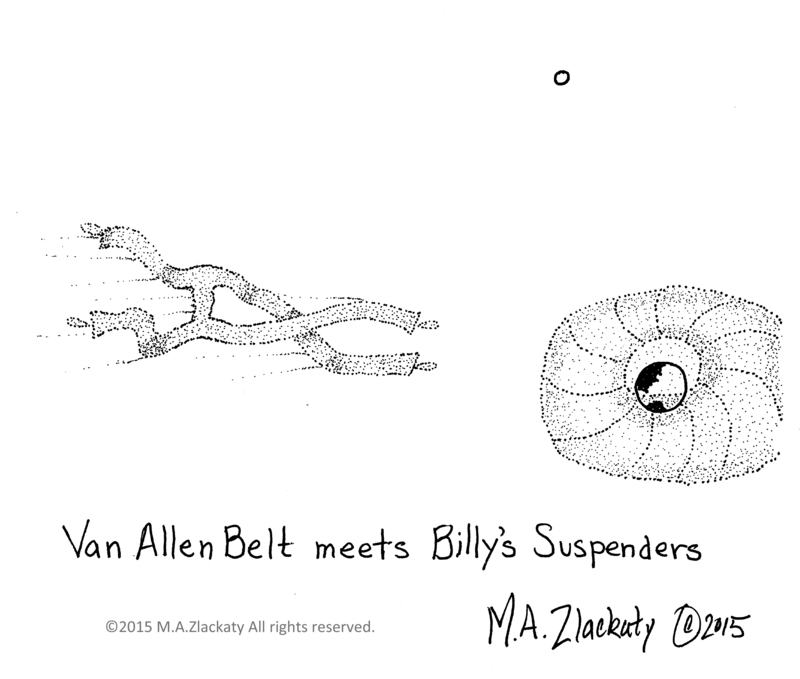 This entry was posted in The Jumble and tagged Astronomy, Cartoon, Cosmic Rays, Humor, Van Allen Belt on June 29, 2015 by M.A. Zlackaty. 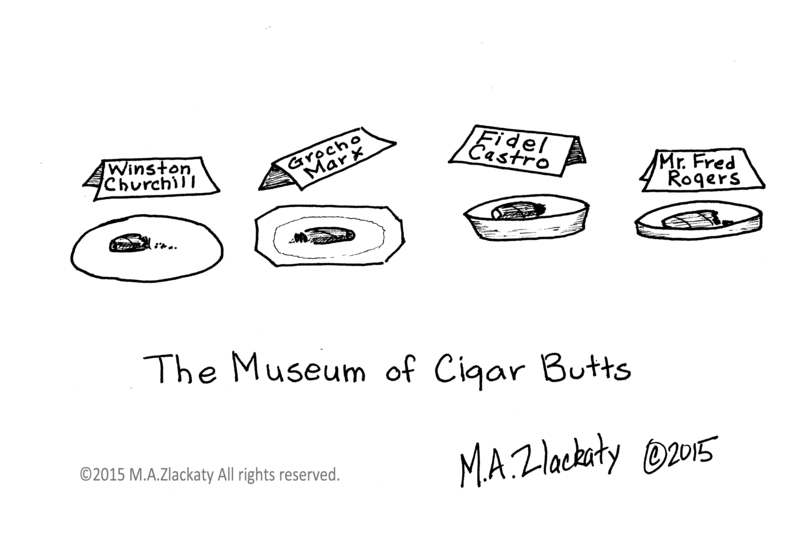 At the Museum of Cigar Butts. This entry was posted in The Jumble and tagged Butts, Cartoon, Cigar, Fidel Castro, Groucho Marx, Humor, Mr Rogers, Parody, Winston Churchill on June 26, 2015 by M.A. Zlackaty. Couldn’t resist this weak, doubled-up cartoon. It’s mate, The Nuclear Family #1, was posted two days ago, if you have trouble with details. Okay, yeah, fine, stop yelling; I promise not to draw the same solution to trash disposal again. This entry was posted in The Real Reason and tagged Atomic Energy, Cartoon, Fission, Fukushima, Humor, Nuclear Reactor, Parody, Reactor Core on June 25, 2015 by M.A. Zlackaty. 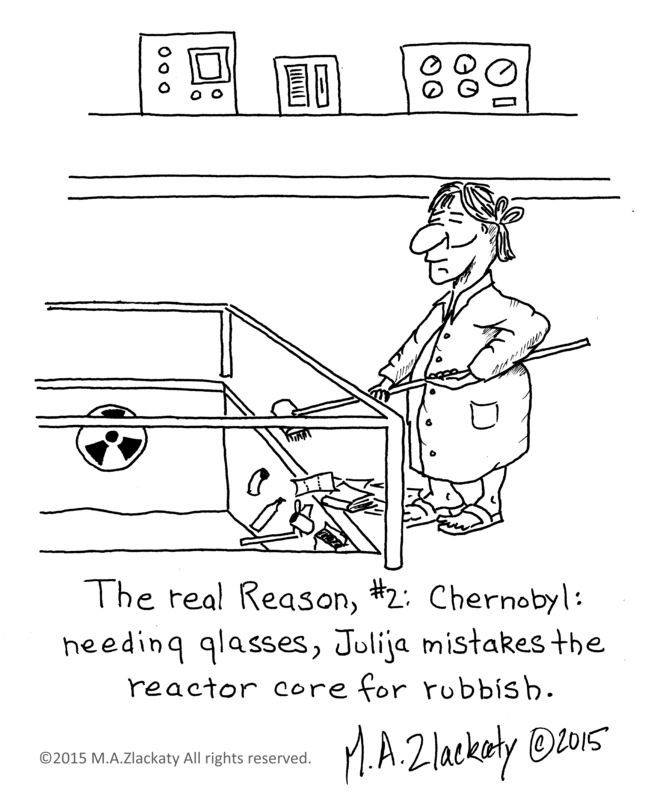 Cartoonist’s Note: Actually I am a strong proponent of nuclear and other renewable energies. I took a Coursera course on nuclear energy a few months ago and, although it may be at least temporarily unpopular, I am convinced it is safe, efficient and a solid, practical alternative, especially for fossil fuel energy. I will not use this venue as a speaker’s platform. But I couldn’t resist the opportunity of poking at least a slight bit of fun at our very capable, cautious and brilliant nuclear engineers. I trust they have a sense of humor and will forgive my trespasses (as we forgive those who trespass against us…). 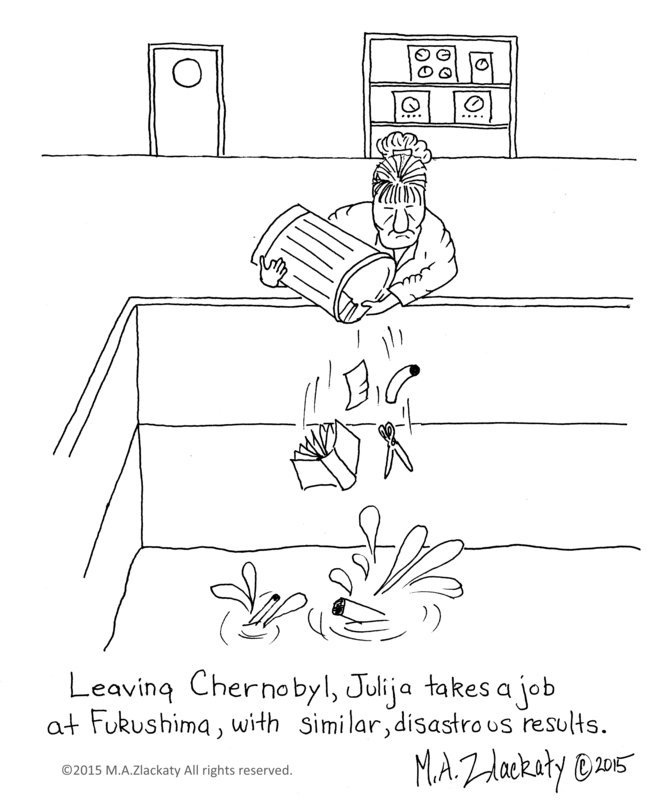 This entry was posted in The Real Reason and tagged Atomic Energy, Cartoon, Chernobyl, Fission, Humor, Nuclear Energy, Nuclear Reactor, Plutonium, Uranium on June 23, 2015 by M.A. Zlackaty. 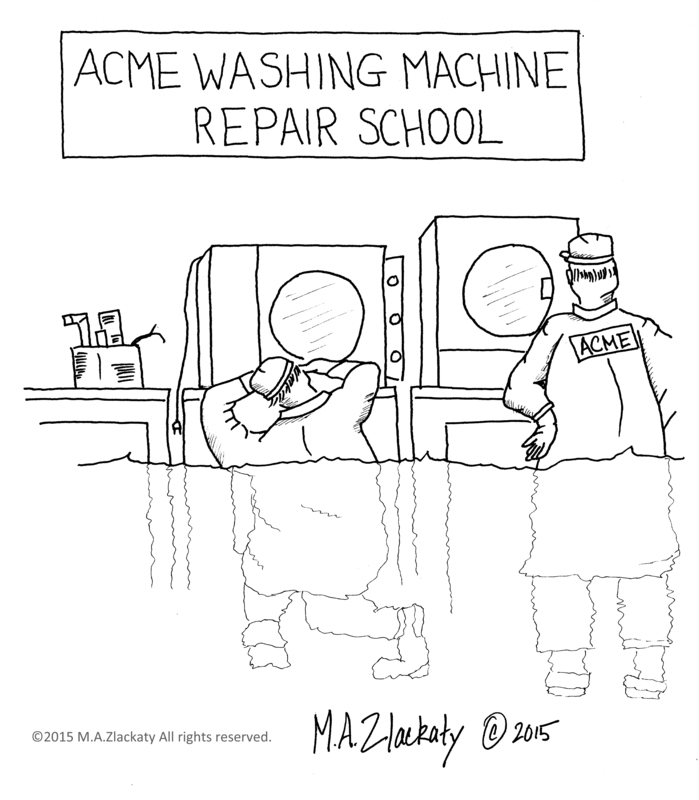 This entry was posted in The Jumble and tagged Acme, Cartoon, Humor, Learning, Parody, School, Washing Machine on June 21, 2015 by M.A. Zlackaty. Cartoonist’s Note: Apologies to Followers, my internet connection these last days has been terrible–nonexistant–so there was no way to upload. 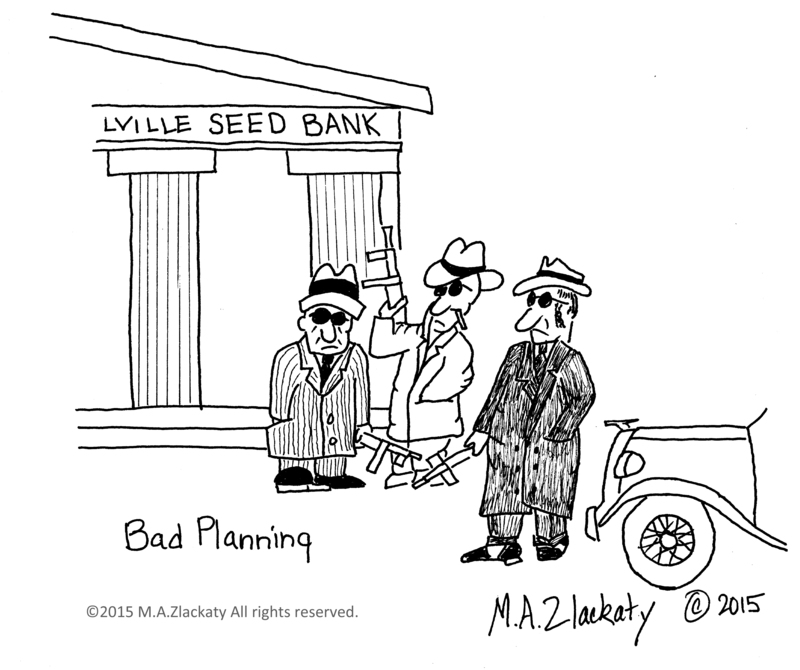 Ordinarily I like to upload one cartoon a day, so I am in the penalty box. I got lucky today but unsure about the next week. Thanks for being patient! M.A.Z. 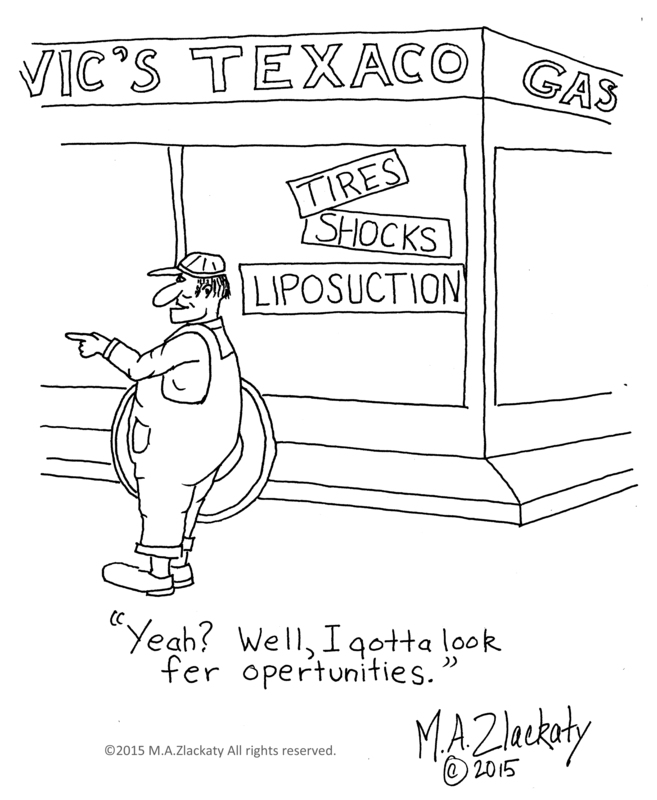 This entry was posted in The Jumble and tagged Cartoon, GasStation, Humor, Liposuction, Parody, Shocks, Tires on June 20, 2015 by M.A. Zlackaty.